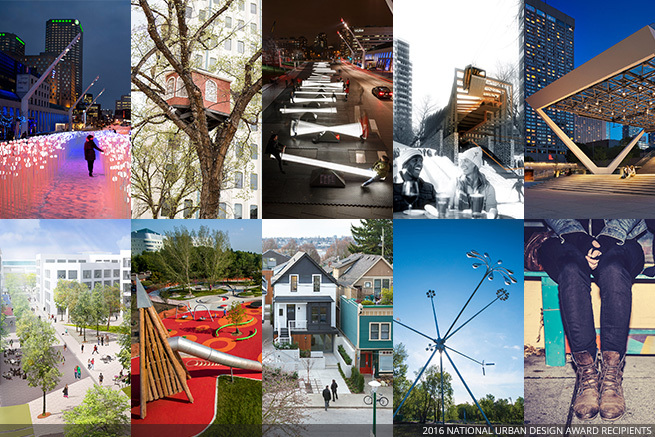 OTTAWA, April 11, 2016 — Nine cities across Canada “have been enriched by the addition of remarkable urban design initiatives,” says the jury of the 2016 National Urban Design Awards. The winning projects range from urban infill to renewed public spaces and playful installations. The awards are part of a two-tier program held in cooperation with Canadian municipalities. The National Urban Design Awards program judged winners of the 2015 municipal awards and entries submitted at large. The awards will be presented during the RAIC’s Festival of Architecture to be held in Nanaimo from June 8-11. Click HERE for descriptions and downloadable images. Queen Richmond Centre West (Toronto, ON) Sweeny&Co Architects Inc.
University of Ottawa Campus Master Plan(Ottawa, ON) University of Ottawa/ Urban Strategies Inc.
Joanne Moran, CSLA: landscape architect, board member of Canadian Society of Landscape Architects,senior project manager at the City of Ottawa. The Canadian Institute of Planners (CIP) is the national voice of Canada’s planning profession. Since 1919, CIP has been dedicated to the advancement of responsible planning throughout Canada. CIP has a membership of more than 7,800 professional planners. It collaborates with provincial planning institutes and associations to promote professional standards, training and certification, as well as best practices in planning across Canada. Visit www.cip-icu.ca.